Bryant Bench is Inspired by mid-century modern design. This plush storage bench brings a sophisticated feel to any room with its tufted top and classic nailhead trim. You'll find plenty of extra storage space inside for blankets, pillows, sweaters, or anything else you might need to tuck away. Get organized in style with the Bryant bench. Potting Bench With Storage Bring out your gardening genius. This potting table with storage is packed with features and functionality. 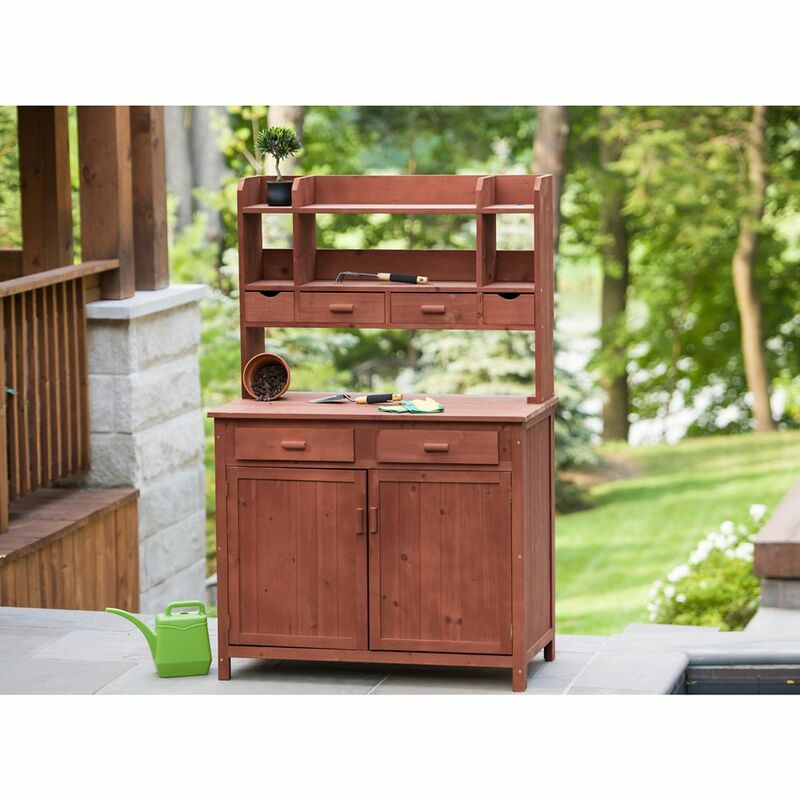 Multiple shelves, drawers and cabinet compartments organize garden supplies so they're within quick, easy reach. Spacious work surface for transplanting, seed starting, potting and getting other garden tasks done. Constructed of solid wood harvested from the Cypress tree family with decay resistance similar to Western Red Cedar. Easy-to-follow assembly instructions included. Ships anywhere in North America. Potting Bench With Storage is rated 2.7 out of 5 by 9. Rated 3 out of 5 by Cindy from Not impressed for what I paid. Parts were broken, dowels... Not impressed for what I paid. Parts were broken, dowels broken off, holes not lining up. Once we glued and stapled the broken parts, fixed the dowels and assembled it, it is a fairly nice bench. Wouldn’t uy it again though. Rated 1 out of 5 by Joe from This is the worst storage unit. The drawers swell and stick and after only 6 mos the bottom floor... This is the worst storage unit. The drawers swell and stick and after only 6 mos the bottom floor of the unit fell out. I did not have anything that was heavy in there, only grilling tools. The door will not stay shut and I had to put a latch on the outside to keep the doors shut. I like the design, but its construction is shoddy at best. I would not recommend buying this as it will surely fall apart before long. Rated 5 out of 5 by Fritzi from This is a great cabinet with plenty of storage. The drawers glide well and the entire piece is re... This is a great cabinet with plenty of storage. The drawers glide well and the entire piece is really pretty. I would say it is much more than a potting bench. I am using it as a furniture piece inside a cabin, so can't speak to how well it withstands weather, but if you're looking for functionality and attractiveness indoors, this is a great choice. Rated 5 out of 5 by Bo from Gardening bench Could not be more pleased with this product. All of my gardening items in one place on my patio. And it is so pretty! Rated 1 out of 5 by MickeyB from A little over one year old & falling apart We purchased this potting bench to use on our patio as a serving table/hutch next to our outdoor kitchen. When we first got it, I loved it! It looked great and served our purpose well, with the exception of the two drawers above the cabinets, which would not open after a rain or if it were humid outside. A little over a year later and it is literally falling apart. The back is coming off, the bottom fell out and the shelves in the cabinets collapsed. I do not have heavy items inside the cabinets. It does get rained on when it does occasionally rain here, but I expected a potting bench to be able to withstand the weather. This one does not. It might would be fine if it were protected and never got wet. Rated 4 out of 5 by Kristin from Good product Easy to assemble. Sturdy. A bit smaller than I expected but overall satisfied. Rated 3 out of 5 by mmSeattle from Expect to repair broken pieces prior to assembly, otherwise easy to assemble and a great unit. In an attempt to assemble the potting bench, there were 8 pieces that were severely broken or shattered upon opening the package. This package was not damaged in shipping, all the damage occurred prior to packing, so expect a day to repair all the pieces, replace unusable pieces with your own wood supplies and for the glue to dry, as I did. Once assembled it looks like it will be a great addition for organizing gardening supplies.